A new porch will be highlighted when Champ Clark Honey Shuck Restoration Inc. kicks off its summer season with a Porch Party from 4 to 6 p.m. Friday, June 2, at 207 East Champ Clark Drive in Bowling Green. Visitors can see – and walk all over — the latest improvement at Champ Clark’s Honey Shuck when the home begins its summer season. A Porch Party is planned from 4 to 6 p.m. Friday, June 2. The house of the former Speaker of the U.S. House of Representatives and 1912 presidential candidate is at 207 East Champ Clark Drive in Bowling Green. A ribbon cutting is planned and St. Clement native Ben Hummel will provide music. The Speaker’s Award, a scholarship for a Bowling Green High School graduate that was made possible by Elenore Schewe, will be presented. In addition, there will be tours, special guests, food and refreshments. The public is invited. The former porch was not original to the two-story structure built in 1888, but had been a concern for years. There was water damage, and boards had to be replaced or painted periodically. “There was no problem as far as safety, but there was always repair work that had to be done,” McCune said. The Honey Shuck board decided it was time to upgrade. 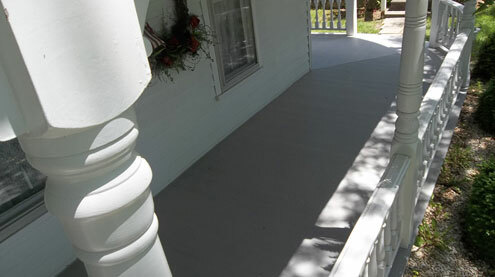 The solution was Koma Grey porch flooring, a plastic that resembles wood but is resistant to moisture and insects. The material is approved for use at places such as Honey Shuck, which is a National Historic Landmark. The installation was done last year by Jeff Givens Construction of Bowling Green. The 115 boards used measured 16 feet long, three-and-a-half inches wide and three-quarter-inch thick. During the project, Givens found rotted supports and sub-flooring. The wood was replaced, but identical posts were not available. So, Givens ordered something similar and then shaped the new posts to match the previous ones. The porch also was slanted slightly so water will no longer accumulate. Donations from area residents and the Bill Hungate Matching Fund Trust paid the $11,873.73 cost. Hungate was a Bowling Green High School graduate and U.S. Congressman who bought the house in 1973 and turned it over to the not-for-profit Honey Shuck board. Some of the old porch boards have been saved. They may later be imprinted and sold as keepsakes for a fund-raiser. Clark purchased the house in 1898 and named it for the seed pods of the locust trees. People who tour the residence will find pods in the front room. Clark and his wife, Genevieve, and their children, Bennett and Genevieve, for years held an annual open house, and Clark invited everyone in Missouri to his daughter’s 1915 wedding in the front yard. Meanwhile, music is an addition for the kick off this year. Hummel and his cousin, Brad Deters, have been playing instruments since childhood. Their band, Open Road, has performed many local events and Hummel produced a compact disc a few years ago. Copies will be available at the Porch Party for $15. It features Hummel originals and cover songs. Each room at Honey Shuck offers memorabilia and preserved artifacts. Tours are done by appointment. Additional information about the home and Champ Clark Honey Shuck Restoration Inc. may be found at www.champclark.org and on their Facebook page.